In response to demand and to support increased production output, NOJA Power has recently expanded its Murarrie facilities to add an additional 900M² of production space for finished goods manufacture and testing. This expansion of NOJA Power's facilities is in response to recent contract awards from both domestic and international customers for the provision of their medium voltage recloser products as well as low voltage switchgear products. Integral Energy and Country Energy, two of Australia's largest users of pole mounted recloser products, have both recently awarded multi year period contracts to NOJA Power. Ports Corp Queensland has also recently awarded NOJA Power with approximately 50 tiers of low voltage motor control centre manufacture for the expansion of their Abbot Point ship loader facilities. 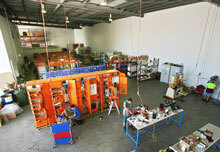 The first 8 tier motor control centre was recently factory acceptance tested for this project.